Skeletal muscles have the intrinsic ability to regenerate after minor injury, but under certain circumstances such as severe trauma from accidents, chronic diseases, or battlefield injuries the regeneration process is limited. Skeletal muscle regenerative engineering has emerged as a promising approach to address this clinical issue. The regenerative engineering approach involves the convergence of advanced materials science, stem cell science, physical forces, insights from developmental biology, and clinical translation. This article reviews recent studies showing the potential of the convergences of technologies involving biomaterials, stem cells, and bioactive factors in concert with clinical translation, in promoting skeletal muscle regeneration. Several types of biomaterials such as electrospun nanofibers, hydrogels, patterned scaffolds, decellularized tissues, and conductive matrices are being investigated. Detailed discussions are given on how these biomaterials can interact with cells and modulate their behavior through physical, chemical, and mechanical cues. In addition, the application of physical forces such as mechanical and electrical stimulation is reviewed as strategies that can further enhance muscle contractility and functionality. The review also discusses established animal models to evaluate regeneration in two clinically relevant muscle injuries: volumetric muscle loss (VML) and muscle atrophy upon rotator cuff injury. Regenerative engineering approaches using advanced biomaterials, cells, and physical forces, developmental cues along with insights from immunology, genetics, and other aspects of clinical translation hold significant potential to develop promising strategies to support skeletal muscle regeneration. Skeletal muscle has robust regeneration properties, but in extreme conditions, the regeneration ability is hindered. It remains a common clinical problem that could lead to long-term disability. The available treatments such as muscle flap transposition present various limitations. To address these limitations, promising strategies based on regenerative engineering are being developed. 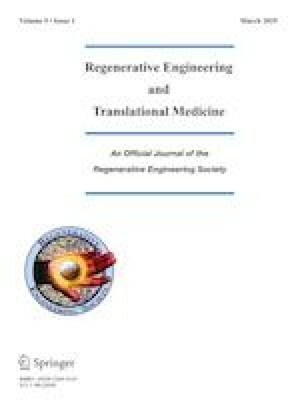 This review article discusses the different approaches to tissue regeneration using the regenerative engineering paradigm. A specific discussion involves biomaterials and their interactions with cells and bioactive molecules. In addition, the advantages of physical and mechanical stimulation in muscle regeneration are discussed. The authors would like to acknowledge the NSF EFRI 1332329 and NIH DP1AR068147 and NIH RO1 AR063698 for funding this work (C.T.L.). Dr. Laurencin is a recipient of the National Medal of Technology and Innovation. C.T. Laurencin, Y. Khan. Regenerative engineering. 1st ed. CRC Press; 2013. https://doi.org/10.1201/b14925. Laurencin CT, Nair LS. The quest toward limb regeneration: a regenerative engineering approach. Regen Biomater. 2016:123–5. https://doi.org/10.1093/rb/rbw002. Rouger K, Larcher T, Dubreil L, Deschamps JY, Le Guiner C, Jouvion G, et al. Systemic delivery of allogenic muscle stem (MuStem) cells induces long-term muscle repair and clinical efficacy in Duchenne muscular dystrophy dogs. Am J Pathol. 2011. https://doi.org/10.1016/j.ajpath.2011.07.022. Lorant J, Jaulin N, Leroux I, Schleder C, Zuber C, Charrier M, et al. Immunomodulatory properties of human MuStem cells: assessing their impact on adaptive and innate immunity. ESGCT FSGT. 2015. https://doi.org/10.1089/hum.2015.29008.abstracts. Mizuno H, Tobita M, Uysal A. Concise review: adipose-derived stem cells as a novel tool for future regenerative medicine, Stem Cells 2012;30:804–10. https://doi.org/10.1002/stem.1076. Darabi R, Santos F, Filareto A, Pan W, Koene R. Assessment of the myogenic stem cell compartment following transplantation of Pax3/Pax7-induced embryonic stem cell-derived progenitors, Stem Cells. 2011;29:777–90. https://doi.org/10.1002/stem.625. Longo UG, Loppini M, Berton A, Spiezia F, Maffulli N, Denaro V. Tissue engineered strategies for skeletal muscle injury. Stem Cells Int. 2012;2012. https://doi.org/10.1155/2012/175038. Delaney K, Kasprzycka P, Ciemerych MA, Zimowska M. The role of TGF-β1 during skeletal muscle regeneration. Cell Biol. Int. 2017. https://doi.org/10.1002/cbin.10725. Pawlikowski B, Vogler TO, Gadek K, Olwin BB. Regulation of skeletal muscle stem cells by fibroblast growth factors. Dev Dyn. 2017. https://doi.org/10.1002/dvdy.24495. Borselli C, Storrie H, Benesch-lee F, Shvartsman D, Cezar C, Lichtman JW. Functional muscle regeneration with combined delivery of angiogenesis and myogenesis factors. 2010;107. doi: https://doi.org/10.1073/pnas.0903875106. Carbone EJ, Rajpura K, Jiang T, Laurencin CT, Lo KW-H. Regulation of bone regeneration with approved small molecule compounds. Adv Regen Biol 2014;1:25276. https://doi.org/10.3402/arb.v1.25276. Bernacchioni C, Cencetti F, Blescia S, Donati C, Bruni P. Sphingosine kinase/sphingosine 1-phosphate axis: a new player for insulin-like growth factor-1-induced myoblast differentiation. In: Skelet Muscle, 2012: p. 15. doi: https://doi.org/10.1186/2044-5040-2-15. Wu F, Jin T. Polymer-based sustained-release dosage forms for protein drugs, challenges, and recent advances. In: AAPS PharmSciTech, 2008: pp. 1218–1229. doi: https://doi.org/10.1208/s12249-008-9148-3. Yang HS, Lee B, Tsui JH, Macadangdang J, Jang S-YY, Im SG, Kim D-HH. Electroconductive nanopatterned substrates for enhanced myogenic differentiation and maturation, Adv. Healthc. Mater. 2015;5. doi: https://doi.org/10.1002/adhm.201500003. Qazi TH, Rai R, Boccaccini AR. Biomaterials tissue engineering of electrically responsive tissues using polyaniline based polymers : a review. Biomaterials. 2014:1–19. https://doi.org/10.1016/j.biomaterials.2014.07.020. van der Schaft DWJ, van Spreeuwel ACC, Boonen KJM, Langelaan MLP, Bouten CVC, Baaijens FPT. Engineering skeletal muscle tissues from murine myoblast progenitor cells and application of electrical stimulation., J. Vis. Exp. 2013; e4267. doi: https://doi.org/10.3791/4267. N. Burch, A.S. Arnold, F. Item, S. Summermatter, G.B.S. Santos, M. Christe, U. Boutellier, M. Toigo, C. Handschin, Electric pulse stimulation of cultured murine muscle cells reproduces gene expression changes of trained mouse muscle, PLoS One. 2010;5. doi: https://doi.org/10.1371/journal.pone.0010970. Cofield RH, Parvizi J, Hoffmeyer P, Lanzer WL, Ilstrup D, Rowland CM. Surgical repair of chronic rotator cuff tears: a prospective long-term study. 2001. doi: https://doi.org/10.2106/00004623-200101000-00010. Gladstone JN, Bishop JY, Lo IKY, Flatow EL. Infiltration and atrophy of the rotator cuff do not improve after rotator cuff repair and. Am J Sports Med 2007;719–728. doi: https://doi.org/10.1177/0363546506297539. Sean Peach M, Ramos DM, James R, Morozowich NL, Mazzocca AD, Doty SB, et al. Engineered stem cell niche matrices for rotator cuff tendon regenerative engineering. PLoS One. 2017. https://doi.org/10.1371/journal.pone.0174789.